Dimensions: 15″ deep x 25″ tall x 15″ wide. Materials: White Oak & a handful of screws. My greatest challenge during the build was getting the side stretcher fit with a mortise and tenon on the back legs and a quarter lap to the front legs. 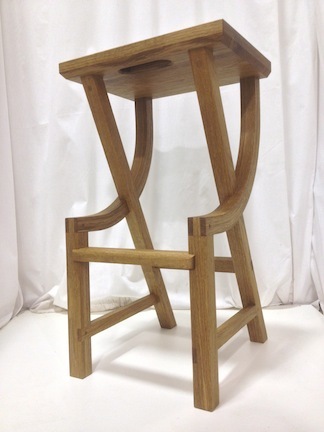 My inspiration for my stool came from a Wharton Esherick chair from a Popular Woodworking article written my Chuck Bender from the June 2013 issue. I took the forward slanting rear legs, the side stretchers, moved the front stretcher down to act as a foot rest, morphed the chair back into a curve terminating at the seat, and added a dash of modern design aesthetic. 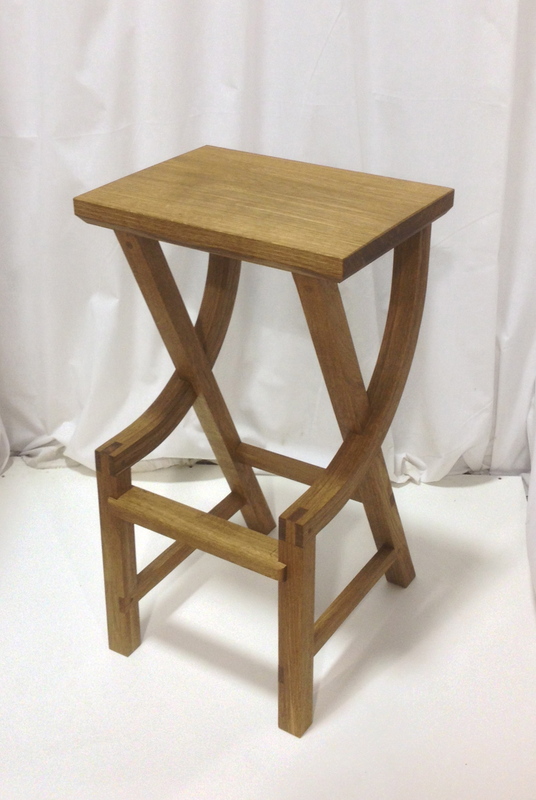 I enjoyed using a variety of joints to create a solid and interesting stool to use for many decades in my shop. I think the next build off should be a coffee table. Thanks again for organizing the build Chris. This is functional art! This is my favorite shop stool thus far. I feel that this piece would be at home in a wood shop, in the kitchen, or some fancy art gallery in New York! Well done! This is beautiful! Most unique undercarriage thus far. Very nicely executed. Fabulous design..beautifully executed. It’s clear that a great deal of thought went into this. Good luck. Amazing design! It is so lovely to look at. Very nice, indeed. And inspiring.